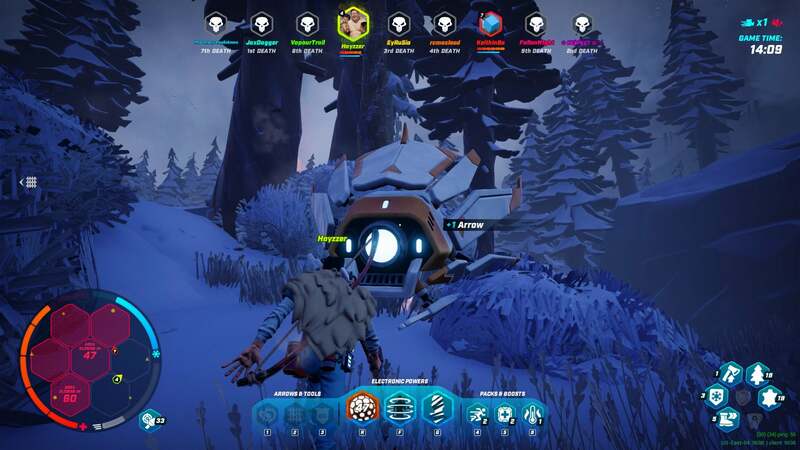 As the seconds counted down in a round of the unusual game The Darwin Project this past weekend, I was aware of three other players still involved in the match. One was my opponent, who, like me, had managed to outlast eight other players in this mix of cold-weather survival and competitive murder. Another was the player I’d let die, who was now spectating me and the other final survivor. “It’s like watching two declawed kittens whale on each other,” he said. The third was a person playing the director, a master of ceremonies role that makes The Darwin Project like nothing else. While comparisons to PlayerUnknown’s Battlegrounds are now inevitable for any battle royale game, that title doesn’t have directors. That title doesn’t have someone deciding that I should be given a speed boost as a reward for surviving as long as I did. It’s one of the twists that makes The Darwin Project, which had a closed alpha on PC this past weekend, so intriguing. The Darwin Project was announced at this year’s E3 via a contextless shoutcast that left me and other onlookers confused but curious. I got to try it myself during this weekend’s closed alpha and found it to be a combination of Battlegrounds’ battle royale and The Long Dark’s temperature mechanics. That mix was tense and hilarious. The Darwin Project pits 10 players against each other in a fight to the death in a snowy arena televised in the game’s fiction. The map comes in segments, which close off as the game progresses. Players are equipped with a melee weapon (in the closed alpha, the only available ones were a mechanically identical axe or snow shovel) and a bow and arrow. Scavenging the environment for wood and leather lets you upgrade your boots, cloak, and axe and craft tools like traps, tripwires, and smoke bombs. You also use wood to build fires to keep from freezing to death as your temperature gauge ticks down. Electronics occasionally drop from the sky a la PUBG’s crates, and these can be used to make the game’s most powerful weapons, such as recharging shields, camo cloaks, and turrets. Using the camo to sneak up on another player (they killed me, but I don’t want to show my embarrassing death in a GIF). Gear comes in variations, selected via a wheel in the game’s lobby. I was particularly fond of fire arrows that trade lesser range for increased damage, ninja boots that erased my footsteps sooner when I was tracked, and a cloak that made me run faster with each upgrade in addition to projecting against the cold. The boots were vital, as visibility is a big feature of The Darwin Project. Crafting, scavenging, or just walking through the snow all leave clues that other players can track to discover your position. The game alerts you when you’re being tracked, which forces you to change how you play. You can plant traps to catch your pursuer unaware, drop a smoke bomb to cancel the track, or jump off a cliff or springboard to erase your footsteps. Additionally, fires can be seen from across the map, meaning you have to carefully plan where to drop one lest you find yourself ambushed. 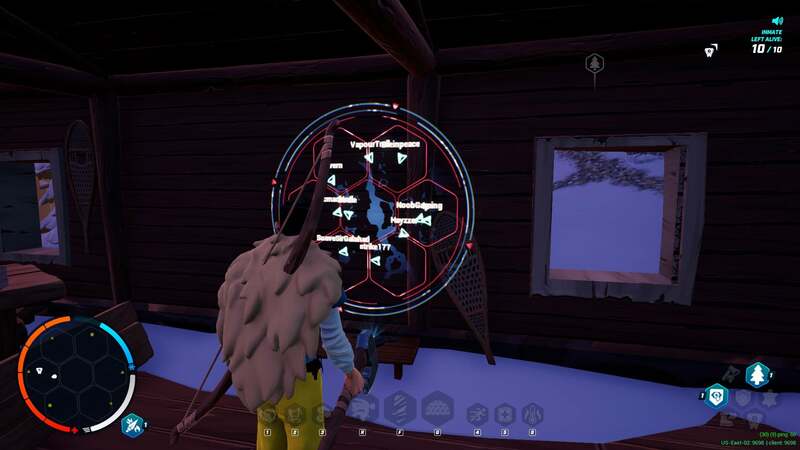 There are houses in the game world that contain maps that show other players’ positions, which you can use to plan your next moves. It’s helpful, but it’s also part of the game’s broader theme of surveillance. When you die, unlike in PUBG, you can spectate the rest of the match, switching between players at will. Spectators appear to be represented by floating cameras that follow the watched player. Many of the survivors I spectated would laugh about people watching them and chat to their viewers. I was seldom disappointed to die early in the game; usually I’d follow the person who’d killed me, enjoying their adventures and learning new tricks. There’s an in-game spectator too, in the form of the show director. For the closed alpha, this role was only available in certain games to certain experienced players. The show director oversees each match as a sort of giant floating camera. The first time I encountered one, I was chopping trees to make arrows when a cheerful “Hey, how’s it going?” came through my headphones. I wheeled around, axe at the ready, to find what looked like one of Portal’s personality cores floating above me. This particular show director told me they had played nearly 170 hours of the game in its various states, and they explained their abilities to me. On a cooldown, they can change the game by closing or nuking areas, giving certain players buffs to their health and speed, reverse gravity, or initiate a manhunt, which reveals a certain player’s position on the map and gives rewards to the player who kills them. A show director. The red zones in the map in the lower left corner indicate areas that have been closed or are closing. There’s the potential for favouritism, obviously, but what I enjoyed most about the show directors I encountered over the weekend was their friendliness and desire to create an enjoyable game. By and large they used their powers to even the playing field—putting a manhunt on a player who was dominating, giving a health boost to a struggling newbie—or to make things more fun by reversing gravity during a showdown or dropping an electronic in the middle of a scuffle for players to fight over. In one match another player was near me, and the show director introduced us and encouraged us to ally with each other to take on other players. In another match a show director playfully shoutcasted my moves at me, making my brief scuffle with another player feel like a thrilling, high-stakes adventure. 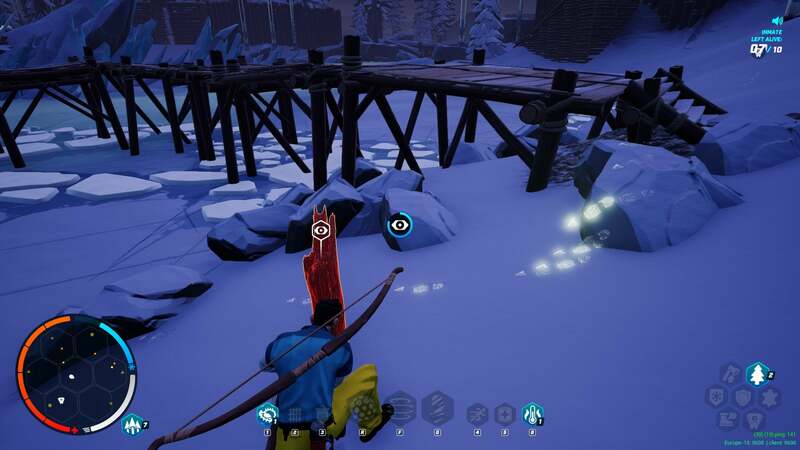 As a battle royale game, I wasn’t expecting The Darwin Project to be as welcoming and joyful as it was. I tend to avoid voice chat with strangers, but I found myself happily turning on my mic and teaming up with people I didn’t know. Spectating one match, I overheard someone tell an ally they’d just met, “This game isn’t toxic, and that’s why I like it,” before speculating that it might change as the game opens up to more players. I could see the game feeling too constrained and easily exploitable as new players are added, though additional content might combat that. In the course of the weekend it felt like a silly, oddly team-oriented take on battle royale. I even won a round (a first for me in games like this), and my success was met with cheers and thanks from my opponent. At the end of one match, the only two remaining players were allied with each other and so were forced to square off. As they’d travelled the snowy landscape together they’d debated how they would handle it. “We’ll give each other a breather,” one suggested, and the other agreed. At the end, they faced each other somewhat sadly, quiet for a moment. Then they dove in, laughing and cheering each other on.